Looking for seven can’t-miss things to do in Put-in-Bay—or just a romantic weekend getaway? Put-in-Bay offers a wide variety of exciting activities! We’ve compiled a list of seven that stand out from recent road trips to Put-in-Bay, Ohio. Plan a day trip, or stay overnight to make the most of what this beautiful island has to offer. This is by no means a complete list—instead, think of it as a short guide to the best of Put-in-Bay, created by our visitors during their time in the jewel of South Bass Island in Lake Erie. Whether you’re planning a day trip to Put-in-Bay, or an overnight road trip, you’ll be sure to find something the whole family will love. And don’t forget to check out this island community’s great hotels and resorts, renowned wineries, and fine restaurants. 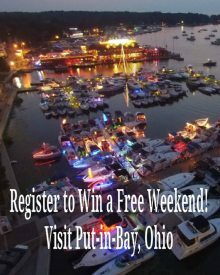 A Put-in-Bay, Ohio getaway has something for everyone! Towering 352 feet above sea level this Doric column was constructed over a three year period from 1912 to 1915 to honor those who fought in the Battle of Lake Erie during the War of 1812, and to celebrate the long-lasting peace among Britain, Canada, and the United States. The Memorial column, rising over Lake Erie, is situated five miles from the longest undefended border in the world. The observation deck offers visitors a stunning Ariel view of Put-in-Bay, the Lake Erie Islands and on a clear day the skylines of Toledo, Detroit, and Cleveland. To visit the observation deck near the top, visitors pay the minimal admission cost then a National Park Ranger will transport them by elevator to the top. Rangers are stationed at the observation deck to answer questions and speak about the history and surrounding area. Nestled on the Southwestern side of South Bass Island is the state park. Visitors will find a well-manicured grounds suitable for a family picnic, a pebble beach for swimming, a playground for the children, Jet Ski and Boat Rentals as well as numerous campsites from primitive to cabins, some with cliffside views of Lake Erie. A public boat ramp is located at the water’s edge. One way to see most all of the Put-in-Bay Attractions is to ride the Put-in-Bay Tour Train. This one hour narrated tour of Put-in-Bay travels the island pointing out places of interest and historical significance. The Put-in-Bay Tour Train offers the ability to get on and off the tour if you stop at a place you are interested in. The cost for the tour train is $10.00 for adults, Children 6-12 are $5.00 and children under 6 are free. The Put-in-Bay Tour Train picks up at the downtown Depot building at the corner of Delaware & Toledo Streets. Memorial Day thru Labor Day hours are 10:15 am to 5:15 pm with trains leaving every half hour on the quarter hour. While considering things to do in Ohio, you might not think of an airport as being one of the more popular things to do, the Put-in-Bay Airport offers visitors a chance to step back into an era when barnstormer pilots and their airplanes toured the country dazzling audiences with their skilled takeoffs and landings and offered rides in their flying machines. The Put-in-Bay Airport offers rides in a restored World War II era WACO bi-wing airplane and are for one or two persons per flight. Each passenger chooses from any or all of these options: Aerobatic thrills, smooth scenic rides, and/or flight lesson. 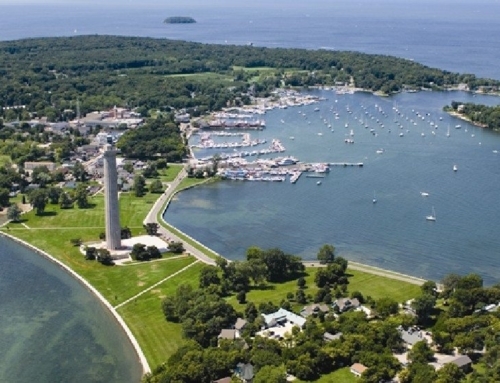 Fly along the beautiful Lake Erie coastline of Put-in-Bay, Middle Bass Island, Kelley’s Island and Port Clinton. Also operating at the Put-in-Bay Airport are the exciting helicopter tours! Choose from one of the two options to see the islands in a truly unique way starting at just $39.99 per person! Put-in-Bay helicopter tours are open from the second weekend of May through the end of September! Our Port Clinton Ohio location is open year around. You can call 914-FLY-HELI to schedule your helicopter tour today. One of the most popular things to do in at Put-in-Bay is to rent a golf cart to tour the island. 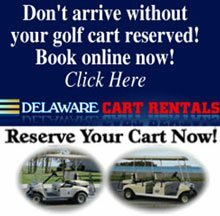 Golf Carts are considered licensed motor vehicles on the island and therefore may be driven upon public roadways just as cars are. Golf Carts are configured in 4 sizes which seat 2-4-6- & 8 people. Gas Powered carts are recommended as they operate at the same speed all day long unlike electric ones that slow down as you drive them. Put-in-Bay Golf Carts are equipped with headlights, taillights, seat belts, roofs & are permitted to be driven 24 hours a day. Maps are available at the rental agency or you can download the Put-in-Bay Island Guide which contains a map as well. All traffic laws apply to golf carts as cars including open container and driving while intoxicated. Reservations for golf carts are strongly recommended and may be made here Put-in-Bay Golf Cart Reservations prior to your arrival to ensure availability. One of our favorite things to do in Put in Bay includes a stop at the Perry’s Cave & Family Fun Center. Visitors will find a wide variety of activities appealing to all ages in one central location. Home to Perry’s Cave which is open Holes for tours, visitors can also enjoy the Butterfly House, Miniature Golf at the War of 18 holes, A Maze, Antique Car Museum, Gemstone Mining and grab a snack at the DannDee’s snack shack. The Family fun center is located in the center of the island and is best reached by a Golf Cart. When making your Ohio Getaways escape, a ride on the Jet Express Ferry boat should be on your list of things to do in Ohio. This high speed narrated historical tour is the fastest way to Put-in-Bay and arrives right downtown near all the Put-in-Bay Ohio Attractions!